Did You Know London Has A Virtual Shooting Range? Lydia Manch Did You Know London Has A Virtual Shooting Range? Because there's no such thing as too niche, London now has its own Scottish game restaurant, meets whisky bar, meets cruelty-free hunting trip. Hidden underneath Mac and Wild Devonshire Square is the Shooting Range Bar, London's first — and as far as we know, only — virtual firing range. 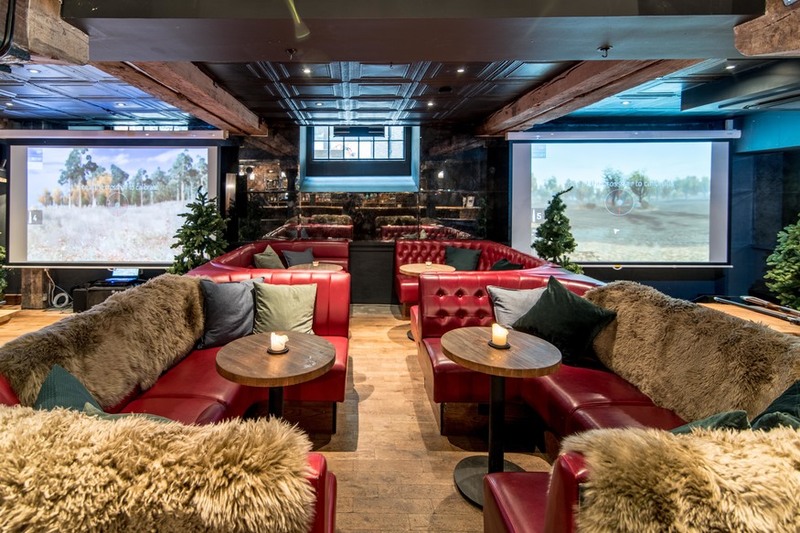 The fur blankets covering the seats are faux, the wounded bison are virtual, and the likelihood of inflicting flesh wounds on yourself or others is... well, no greater than at any other London bar where the spirits flow this steadily. One wall is devoted to whisky, and the rest of it's fitted out with two lanes of Marksman Training System tech, the same stuff used by Olympic rifle shooting medallists for training, and firearms licensing bodies for certification. We'll be honest: killing a piglet, even a virtual one, feels mildly devastating. Fortunately there's a range of programmes — single and two-player, savannah and lakeside, large game and winged beasts — including clay pigeon shooting and a police-style shooting range with paper targets, for the less bloodthirsty. We drink whisky cocktails that arrive wreathed in smoke, raid the bar's clothing box for tweed caps and waistcoats to dress up in, and channel any number of Bruce Willis films as we riddle our virtual targets with virtual bullets. Anybody old enough or retro enough to love 1984 Nintendo classics is going to be in raptures here: this is very much Duck Hunt deluxe. Mac and Wild's Shooting Range Bar is one of those places where being an adult is almost exactly what you dreamed it'd be like when you were eight. Lanes are £70 an hour, open Monday - Saturday from 12pm-11pm. Mac and Wild Shooting Range, 9A Devonshire Square, EC2M 4YN.